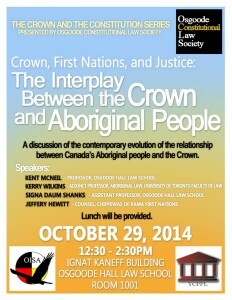 considered one of Canada’s pre-eminent experts on Aboriginal Law. Osgoode’s faculty in July, 2014. McMurtry Clinical Visiting Fellow at Osgoode. 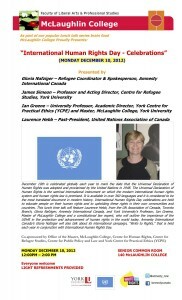 This event was organized by the Osgoode Constitutional Law Society (OCLS), with generous help from the Monarchist League of Canada and the York Centre for Public Policy and Law. 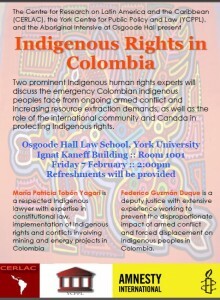 Two prominent Indigenous human rights experts, Maria Yagari and Frederico Duque, will discuss the emergency Colombian indigenous peoples face from ongoing armed conflict and increasing resource extraction demands, as well as the role of the international community and Canada in protecting Indigenous rights. María Patricia Tobón Yagarí is a respected Indigenous lawyer with expertise in constitutional law, implementation of Indigenous rights and conflicts involving mining and energy projects in Colombia. Federico Guzmán Duque is a deputy justice with extensive experience working to prevent the disproportionate impact of armed conflict and forced displacement on Indigenous peoples in Colombia. This event is co-sponsored by the Centre for Research on Latin America and the Caribbean (CERLAC), the York Centre for Public Policy and Law (YCPPL), and the Aboriginal Intensive at Osgoode Hall. 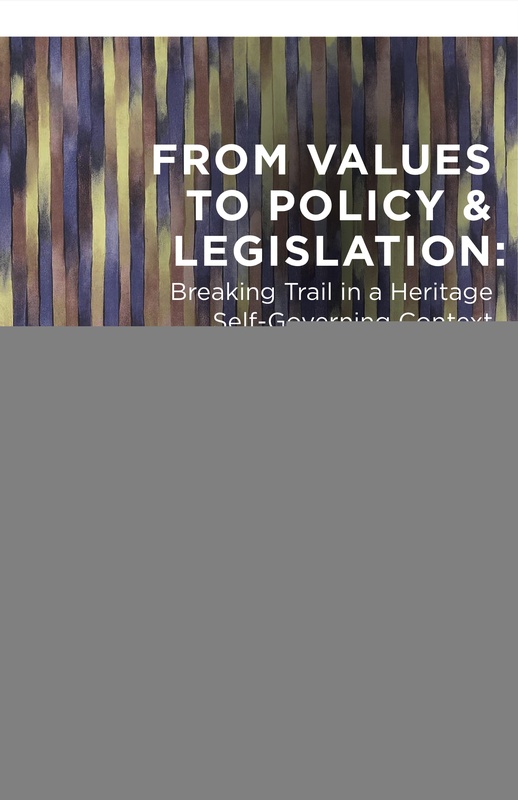 This one-day student conference will feature paper presentations along with poster displays of 4th year student researchers whose work addresses the increasing prevalence of culture in public policy making. 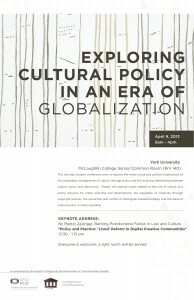 In aiming to explore how globalization has impacted our definition of culture and increased its value in the new “knowledge economy”, students will present research on topics such as the current use of culture in urban planning and development, the place of cultural policy in nation-building and the role of cultural policies in shaping “creative industries.” Please join us to celebrate our students’ contribution to York’s research community. All are welcome to attend. 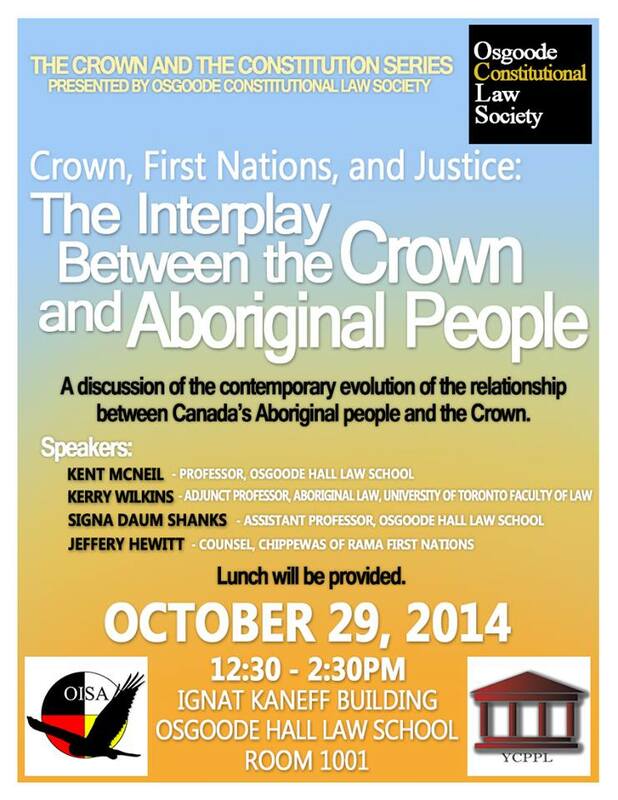 and the Aboriginal Intensive at Osgoode Hall. Osgoode Hall Law School, the York Centre for Human Rights, the York Centre for Public Policy and Law, the Canadian Forum on Civil Justice and the IFLS are proud to support this symposium organized by Osgoode Professor Bruce Ryder and Osgoode McMurtry Visiting Clinical Fellow Fay Faraday. Additional information, posters, programs and papers can be found here. 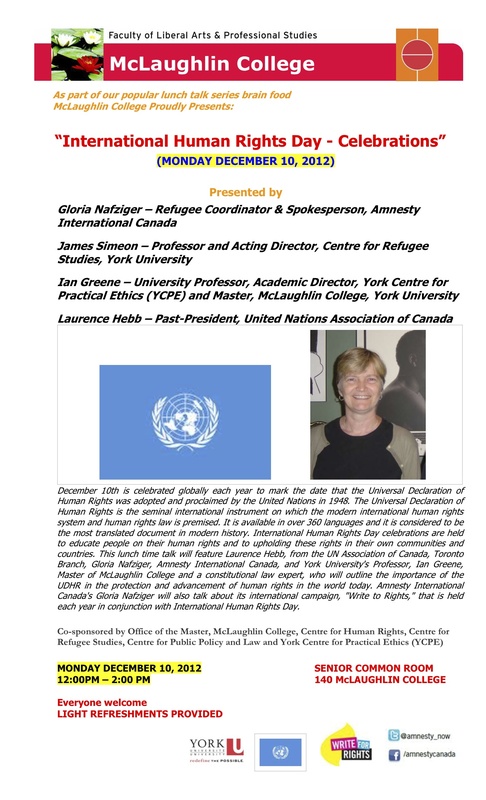 YCPPL associate Ian Greene, Director of the Centre for Practical Ethics, who will speak about the importance of the Universal Declaration of Human Rights and its impact on Canadian law. Amnesty International representative Gloria Nafziger, who will provide information on Amnesty International’s “Write to Rights” campaign. All are welcome to attend – Please come out and help us celebrate! Light refreshments will be served. 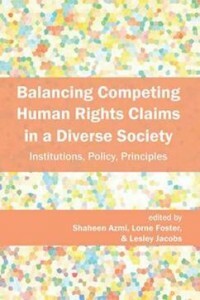 Institute for Feminist Legal Studies and the Centre for Feminist Research. Please let Alicia know if you need any Code-related accommodation. Feel free to distribute this invitation to anyone who would be interested in this event. But respond early – spaces are limited. Despite its vast contribution to legal scholarship, CRT as a lens is absent within the contemporary law school curriculum. It is for this very reason, the conveners are compelled to re-ignite interest in CRT and infuse the institutional structure with a new mode of engagement. 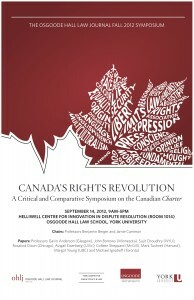 The symposium will seek to address the definitional contours of CRT, the distinctions between American and Canadian CRT and its pragmatic constraints and challenges. 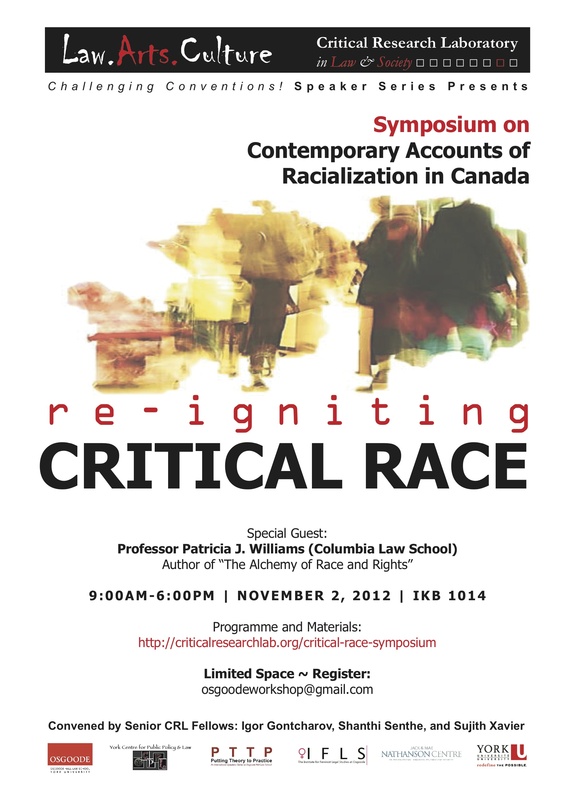 We will inquire into how CRT is used to interrogate the law in modern times, notwithstanding aboriginal, ability/dis-ability, class, feminist, post-colonial and queer influences. Our conversation, therefore, is a starting point and a point of departure to critically engage in self-reflection. 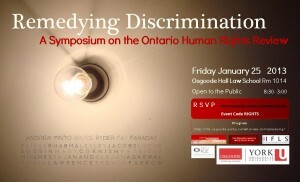 For more information please visit the symposium website here. 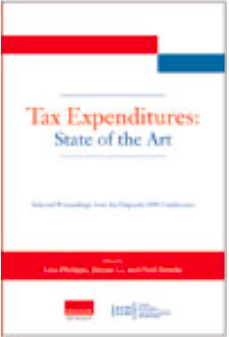 For Tax Expenditures: State of the Art (Lisa Philipps, Neil Brooks and Jinyan Li eds. ); Comments by Jeffrey Simpson, national affairs columnist for The Globe & Mail. 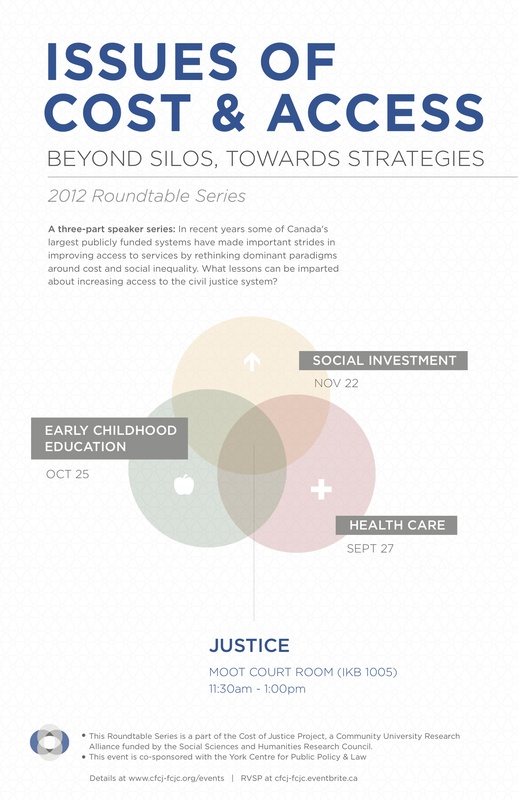 In recent years some of Canada's largest publicly funded systems have made important strides in improving access to services by rethinking dominant paradigms around cost and social inequality. 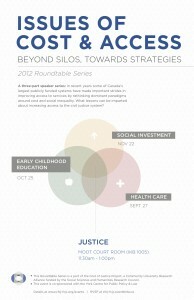 What lessons can be imparted about increasing access to the civil justice system?Join us for this three part Roundtable Series hosted by by the Canadian Forum on Civil Justice that will explore parallels to access to civil justice by engaging experts on health care, early childhood education and social investment. 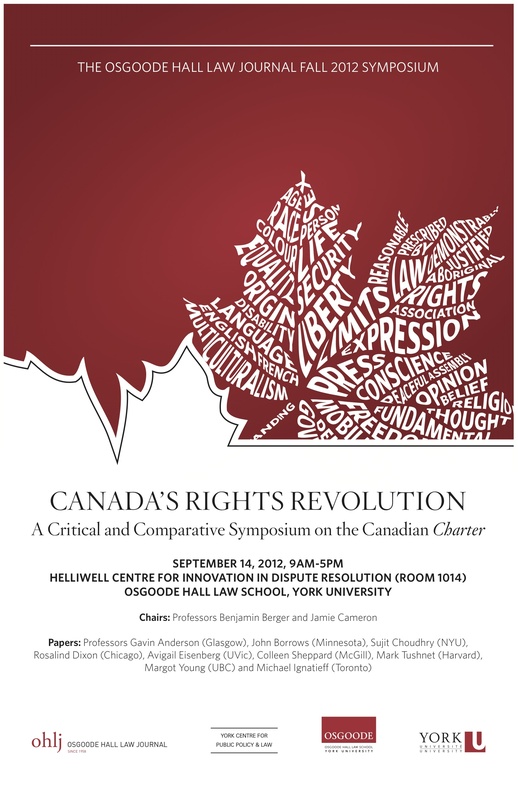 The YCPPL was a proud co-sponser of the Osgoode Law Journal's Symposium on Canada’s Charter of Rights and Freedoms, held at Osgoode on Friday, September 14. Papers were presented at the Symposium by Professors Gavin Anderson (University of Glasgow); John Borrows (University of Minnesota); Sujit Choudhry (New York University); Rosalind Dixon (University of New South Wales); Avigail Eisenberg (University of Victoria): Colleen Sheppard (McGill University); Mart Tushnet (Harvard); and Margot Young (UBC). 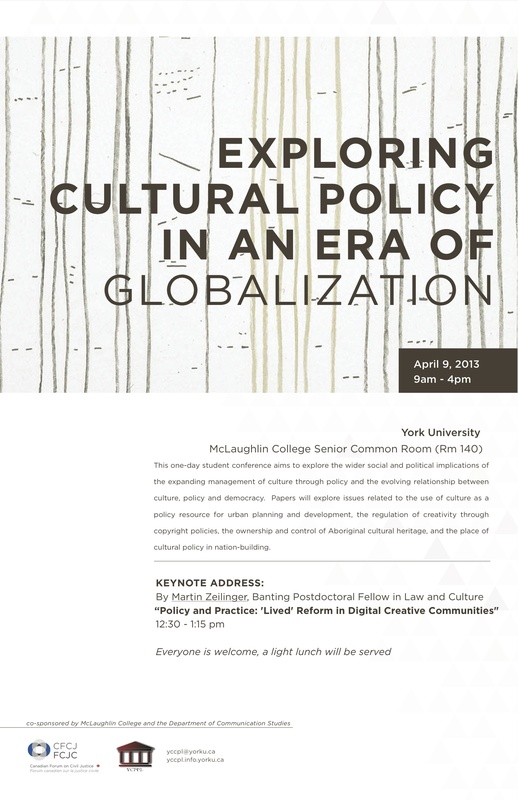 Along with Robert Leckey (McGill) and Jennifer Nedelsky (Toronto) Osgoode Professors Sonia Lawrence and Bruce Ryder participated as discussants, and the Symposium closed with concluding remarks by Michael Ignatieff. 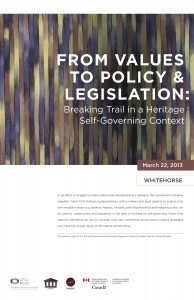 Sessions throughout the day featured lively debate about the Charter’s jurisprudence on freedom of religion, equality, social justice, and aboriginal issues. 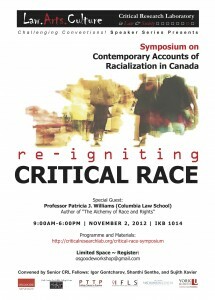 The papers from the Symposium will be published in 2013 as a special issue of the Law Journal. To view the conference online click here.